Many of you have obligations too, I know. Work, church, kiddos, extraÂ curriculars, etc. sometimes you don’t have the time or the energy to spend hunkering over the stove, or your child(ren)/spouse is hungry and hungry NOW. I understand. That was exactly my situation last night. Pasta is usually a quick easy dinner to cook up. From start to finish we are usually eating in less than 30 minutes if we decide to make pasta for dinner. Recently a friend on Facebook posted a picture of her dinner, a comfort food her mother used to make her. It was pasta, browned butter, roasted walnuts, and Parmesan cheese. It sounded so good. So last night when my children were soooo hungry I decided to whip up my version of that comfort dish with things I had on hand. I used pecans and tossed in some basil and lemon zest too. I love browned butter and could see many other variations of this simple dinner. AÂ little side story: As Sasha was eating this last night it was evident that she was enjoying it. “Mmmmmm. Mmmmm.” She kept saying. Finally when she didn’t have any food in her mouth she said, “why don’t you work in a restaurant? This is soooo good. Daddy could take us there and we could eat the dinners you cook.” This made me smile. What a great ego boosting compliment from my sweet six year old. What is your favorite quick meal? Boil pasta according to manufacturer's instructions. Drain and return to pot. While pasta is boiling place butter into a sauce pan and brown over medium heat. Watch carefully once it starts to change colors because it will go from browned to burned quickly! Once the butter is becoming browned. Turn off heat and stir in pecans carefully, the butter will bubble up. 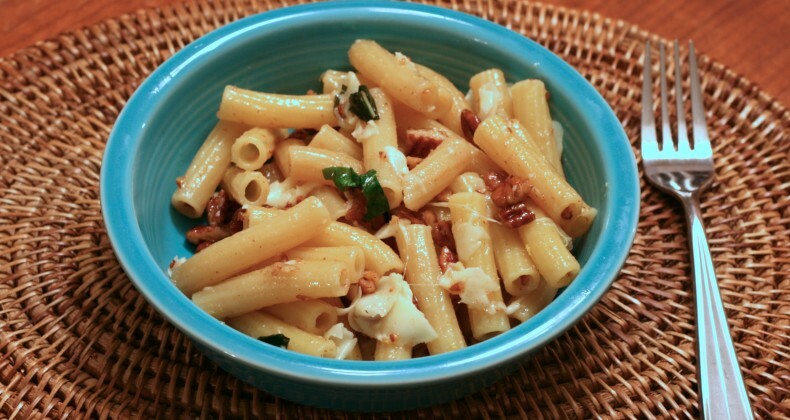 Pour butter & pecans over pasta. Stir. Stir in lemon zest, cheese, and basil. Serve. We do a similar dish with noodles and feta cheese – it’s like mac’n’cheese for grown ups! Up your enchilada game with an easy homemade sauce. There is a new sheriff in town and it is Enchilada Tuesday and she is here to stay.